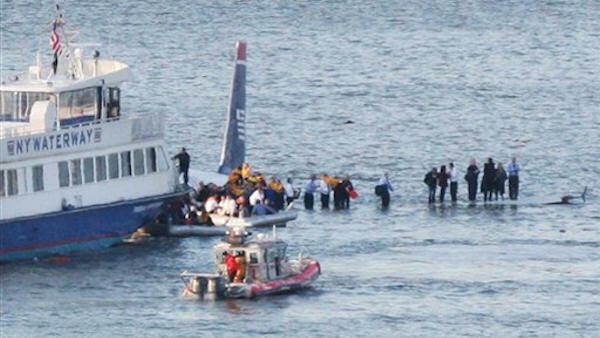 NEW YORK -- Thursday marks six years since the Miracle on the Hudson, when US Airways Flight 1549 crash landed on the river with no fatalities. Standing in frigid temperatures at the time and watching a plane with people standing on the wings floating down the Hudson was a sight many could not believe. Six years later, those people remember it like it was yesterday. "We have much to be thankful for," pilot Chesley "Sully" Sullenberger said. "Much was saved that day." The courageous captain and his crew piloted the crippled jet and made an unthinkable belly-first landing on the frigid waters of the Hudson. Now, they able to raise their glasses of champagne with some of those passengers in a "toast to life" that all 155 onboard were rescued. "Many people came together, did their jobs exceedingly well, to give us such a wonderful outcome," Sullenberger said. "Had even one person not survived, I personally couldn't have celebrated any of this." Flight 1549 had just taken off from LaGuardia Airport for Charlotte, North Carolina, when a flock of geese disabled the engines. Circling west and then over the George Washington Bridge, the plane with 150 passengers and five crew members glided to a water landing. "I saw half the plane submerged in the water and was just astounded by the miraculous event that just occurred and was just thankful, just absolutely thankful," passenger Ian Wells said. Those on board then began moving precariously out onto both wings in what has become an iconic picture. Captain Vince Lombardi's boat was the first. "It just goes to prove what discipline and hard work and team work, how successful it turns out," he said. Many of those saved have moved on from the historic event, choosing to remember it in their own way. But are all part of a special second family. "We're going to celebrate all of this," passenger Barry Leonard said. "It's amazing what has happened...and we look forward to celebrating."